من يوم يومي بكره المقدمات.. مش كرمال شي بس لان شو ما تكون عم تقرا, على طول المقدمة كذب.. يعني الكاتب بيبقى حايص مش عارف شو يكتب ليرغبك تكمل قراية فبيكتب حيالله شي.. اجمالا كذب او مبالغة تيجبرك تقرا صلب الموضوع.. يعني ان اظر ووردز متل ما عملت انا هلق صرلكن ساعة عم تقروا وبعد ما عندكن فكرة شو موضوع النص..
اليوم بقطر انعقدت القمة العبرية على مستوى الرؤساء..
دول ال 5 + 1 قمة..
ليصيروا قمة.. لازم يكون في زلم بيناتن..
كان بينن زلمة اسمو صدام.. بغض النظر عن رأيي في.. تواطؤوا مع الامركان ضدو وقتلوا..
كان بينن زلمة اسمو قذافي.. بغض النظر عن رأيي في.. تواطؤوا مع الامركان ضدو وقتلوا..
والزلمة الوحيد المتبقي لغولوا مقعدو..
وبتعرفوا شو الحلو؟ انو هيدا مش رايي الشخصي.. هودي الامركان والغرب كلو هيك نظرتهم..
يعني لو بالعادي بطلعوا قرارات مصيرية وحاسمة.. كنا زعلنا.. بس ما هيدا بعدنا عم نقلكن.. اجتماع نكتة مش اجتماع قمة..
شو متوقعين يعني منو للطبل..؟ انتوا معكن خبر انو عمل انقلاب على.. وايت فور ات… على بيو! ايه عمل انقلاب على بيو تيوصل للحكم..
قطر لازم يغيرولها اسمها يسموها جشع.. اللي ما بيعرف معناتها يشوفها بالمعجم..
النكتة العربية بايخة كتير.. ورغم هيك من يوم ما خلقت بضحك العالم..
الله يشبع العرب.. والله يعين العرب على هالسنة يلي رح تترأس فيها جشع النكتة العربية.. 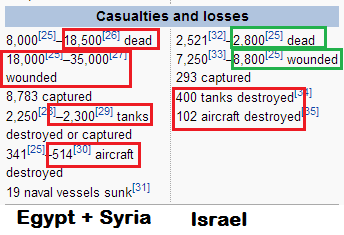 The October war, the Ramadan war or the Yom Kippur was the 1973 Arab–Israeli War fought from October 6 to 25, 1973, between Israel and a coalition of Arab states led by Egypt and Syria. The war began when the coalition launched a joint surprise attack on Israel on Yom Kippur, the holiest day in Judaism, which happened to occur that year during the Muslim holy month of Ramadan. Little do I care about the details of events that led to or/and followed the war, little does it matter to me who of the 2 sides won that war. However, as an Arab, I grew up to stories that told me that Arabs won that war..
Chatting to an old man about the war, he laughed and told me that it was the worst war in history… Arabs never won anything. Everything they reclaimed in the early days of the war was taken back by Israelis except this time they forced the Egyptians to keep their army away from the borders. Later I decided to Google the 6th of October 1973… I was curious to know more about the whole thing. 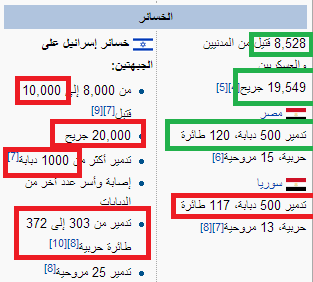 My Google homepage set as .com.lb I got Arabic results which I didn’t mind so I opened the link..
Reading the small introduction which taught me almost nothing new, I decided to directly check the death toll, casualties and losses in both sides and this is what I got. which makes one believe that someway, somehow Arabs may have prevailed in this war…. Or so you would think. Thank God for Wikipedia and after reading a couple more paragraphs in that article I thought I should check the English version. Logically the death toll at least should be similar… so I opened the link..
Reading the small introduction i learnt that Arabs attacked on the holiest day in the Jewish calendar and called it using the element of surprize. While the Arab version did not talk about this point, the English version stresses on this matter. Anway, again I jump straight to the casualties table and this is what I got. On the other hand let us see the results as described by both versions of stories. in case you don’t understand Arabic, the pic above describes banning Arab oil from Western countries and the crossing of the Suez canal as accomplishments and results of the war, failing to mention that soon after the war ended, Arab oil returned to maximum flow to the West and that the Egyptian Army crossed back the canal. It also mentions that a cease fire treaty was signed on the Syrian front. If you want my opinion?? Of course the English version explains exactly what “really happened”. Very funny.. eh?! They both have their “facts” and “stats” referenced… okay maybe the English version was better referenced with over 329 references compared to the very shy 7 references of the Arabic version. But hey Israelis lie they control the media, the internet and everything else..
They’re evil, I honestly believe the Arabic story but the funny thing is whether you chose to believe the English or the Arabic story one thing remains for a fact. I’ll put them into points to make it clearer. So basically, the whole “victory” or accomplishment lasted only for a couple of days, yet still, silly as we are, we gather to celebrate this shameful war convincing ourselves that we won that war. Syria went on to never fire a single bullet at Israel and for that the International community delivered them Lebanon as a trophy for 30 years to follow. I will leave judgement to you with hopes that one day everything will change.